When you wake up in the morning, chances are you are not particularly excited about shaving. It’s just not that much of an engaging task. However, your approach to the morning routine might be better if you have an electric shaver like the Panasonic ES-LV81-K Arc 5. While the price of this razor might make you think that this shaver must be designed for some sort of professional use, in fact, it is actually very practical and suits every day shaving. You just have to ask yourself how much is it worth to you to avoid frustration on a daily basis. If you are looking for the best of best in terms of shaving, then the ES-LV81-K Arc 5 Electric Shaver is the product for you. the motor is top-notch, as well. It moves at 14,000 cycles per minute which allows the hair to be cut quickly without pulling or tugging. The Lift-Tech foil is designed to lift hairs that lay flat and cut them. That’s 4000 rpms faster than the braun 790cc! This feature alone can make it a head shaver. for your mustache or sideburns, simply flip up the pop-up trimmer. Customers found it hard to find reasons to criticize the ES-LV81-K. They found that its motor is so much quieter than other brands’ top models. Like a Mercedes, one said, you get the pride of knowing that not too many people have coughed up the dough for it. Even so, it performs spectacularly. With just a little practice in applying medium pressure, owners found that they got a great shave, every time. One noted that it was really nice that the shaver does not spray or leave a trail of shavings in its wake. There has never been a product that has been 100% free of complaints or areas in which improvement could be made. No matter how far you look, you will never find a perfect product. In saying this, there are only a handful of minor complaints that pop up from customers reviewing the ES-LV81-K Arc 5 Electric Shaver. For one, some say that the head is much larger than other electric shavers. To some, this is a benefit in decreasing the amount of passes you have to make across your face. To others, it was a small annoyance in trying to get into hard-to-reach spots. It really comes down to what your preference is. I have a more comprehensive review of all the Arc 5 shavers. You can see the full panasonic arc 5 reviews here. The lithium-ion battery fully charges in one hour which supplies 45 minutes of use. The 10-stage LCD tells you everything you need to know, including a charging indicator, battery status and reminders to clean the blades. If you want to take it on-the-go, the lock button and pouch prevent the device from going off by surprise. Since this is the top model coming from Panasonic, it has many more features than the lower-end products. Although the 10-stageLCD, linear motor and battery charging system come standard in most Panasonic electric shavers, some things do not. in the less-expensive versions, you get three or four blades instead of the five with this razor, and the shaver head on inferior models is not multi-flex. This multi-flex really helps to shave the contours of your face or your head. You deserve some comforts in life. Sleeping in would be great, but we know that’s not going to happen. Why not improve the quality of your shave and cut down on the time wasted in your morning routine by buying this excellent razor on Amazon today? 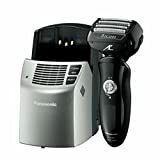 The Panasonic ES-LV81-K Arc 5 has just about everything you could possibly need or want in an electric shaver. The only thing Panasonic can’t do for you is the actual shaving part. But at least with this razor all the effort is taken out of the choir of shaving. Who knows, you might even begin to enjoy the experience!